Unfortunately I was unable to submit Blog updates daily due to technical issues in Newfoundland with internet availability after Tuesday. In addition, our video production chief Michael Engel had a kidney stone attack on Thursday PM, forcing him to spend Friday in hospital in Burin. So we raced with minimal video coverage Friday. Michael is now safely back in Toronto trying hard to pass along those stones to whom ever will take them. Our team had a very successful week of racing. After the storm blew through on Tuesday the weather cleared up for the rest of the week. We had sun, heat and more sun with no clouds to be seen. Wednesday started off with Jon & Briar (#1333 – MINI) in 1st place with only 3 penalty points followed by John Sr and Craig (#1888) with 6 points followed by John Jr and Mel (#1999) with 7 penalty points. We were all bunched up at the top of the leader board in GT class (as it should be). As the day wore on and the races were run, fatigue reared its ugly head a wee a bit for two of our teams. The allowance for error was reduced on this day to only 6 seconds per race, so it became a bit more challenging to zero out each race. 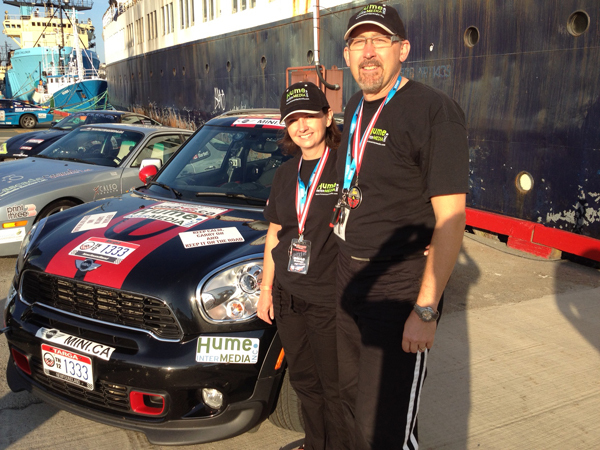 We ran 8 races Wednesday and drove almost 500 KM doing so. 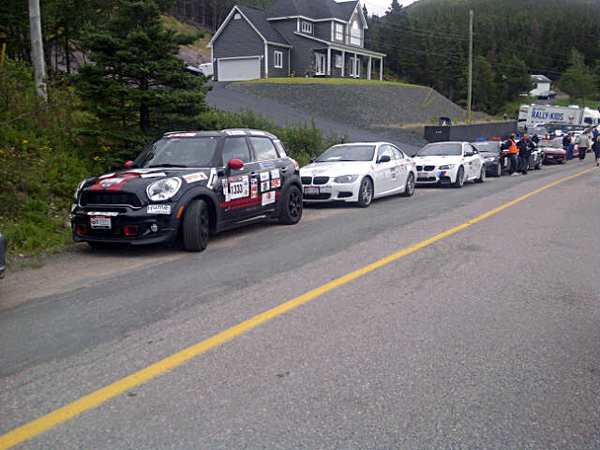 The last two races of the day were through Clarenville, a town halfway between St John’s and Gander. This is a tough race to zero out as we must average 70 kph through the town’s streets. 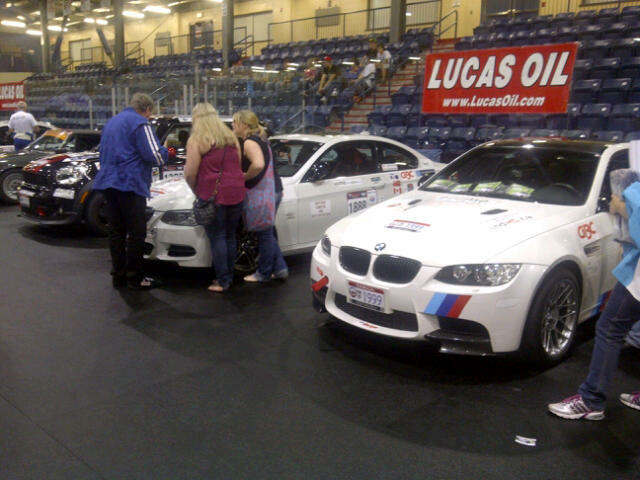 However all 3 Hume vehicles did just that, at least in Clarenville. End of day John Sr and Craig picked up 2 penalty seconds while John Jr and Mel picked up 7. Meantime Jon and Briar picked up 2 in the MINI. 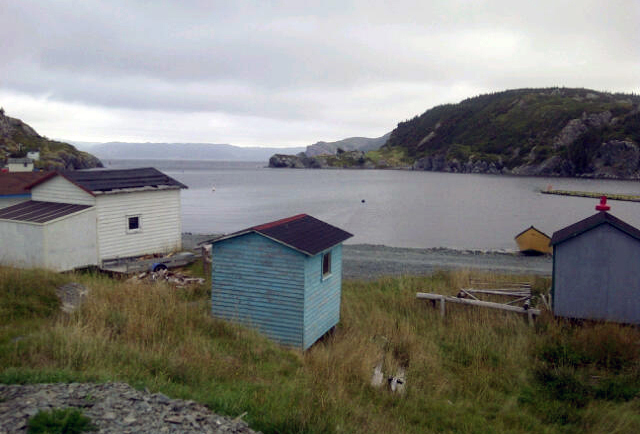 Thursday we raced through the absolutely beautiful Burin Peninsula. The view all around when driving is incredible. Everyone needs to visit this place sooner or later. 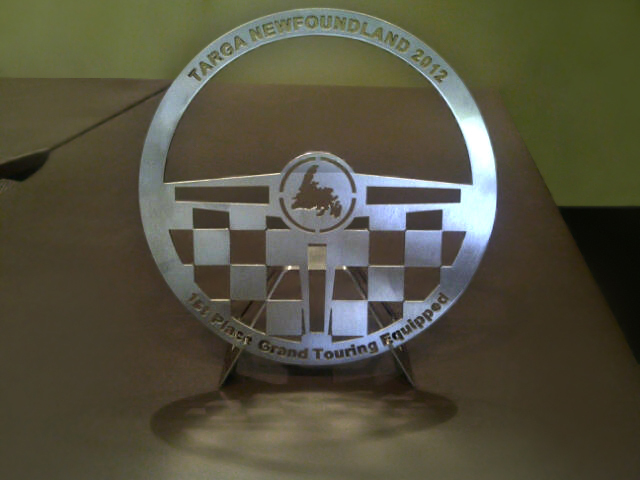 The penalty points system used by the Targa officials is prone to revision after review by the time keepers. So by Thursday AM our actual standings were not entirely clear. Never the less, there were 8 races scheduled Thursday while one was canceled (we raced 7). Jon and Briar started to show some very tiny cracks in their “system” this day, picking up net 2 more penalty points. While John Sr and Craig picked up 6 and John Jr and Mel gained 17 points along the way. The window for error was reduced to just 3 seconds per race. So we were being forced to run nearly perfect times in order to avoid picking up penalty points. In addition, Thursday’s races were run mainly through very difficult town rotes (such as Garnish). Yes Garnish, the course I manage to mess up every time I race it. 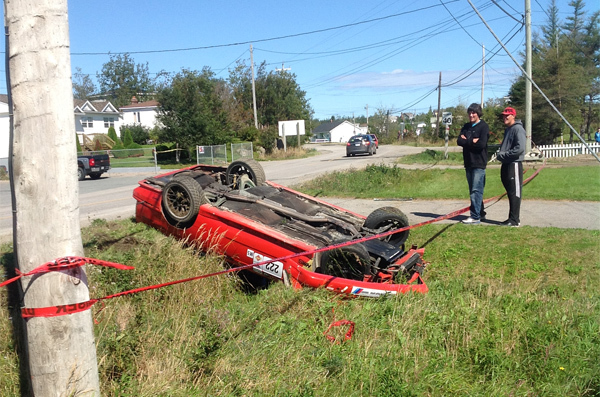 This year I nearly took out a fence next to the church after missing my hairpin turn. Then second race through I turned too soon behind that same church. I had to back track and try to make up 25 lost seconds. I managed to fly along the last half of the high speed portion at speeds averaging 140 kph and made up most of the lost time, but not all. Meantime John Jr and Mel got their speed and times signals mixed up in Garnish and picked up a whopping 14 seconds over the two races through town. Wow, that’s gotta hurt! However, our other competition was fairing even worse. The closest competitor to us was a very distant 48 seconds behind. Ahh, Friday. Talk about being tired and not realizing it! We as a team have discovered adrenaline will carry you through a stressful time for almost exactly 4 days, but no more! Plus, the window for error is reduced to just 2 seconds per race on this final day with 7 races scheduled. Now we needed to be perfect to avoid picking up points. Friday’s first race was a long fast one into a fishing village at the end of a fiord (gorgeous scenery). Just to make things interesting at the last minute, race organizers decided to cut a piece of the race. So, we had to recalculate our times and distances in a hurry at breakfast that morning. At race start my co-pilot Craig forgot about the deletion and tried to guide me at 100 kph through the red tape that was now blocking off that part of the course. Only lightening quick reflexes on my part held us to 4 penalty points in race 1. 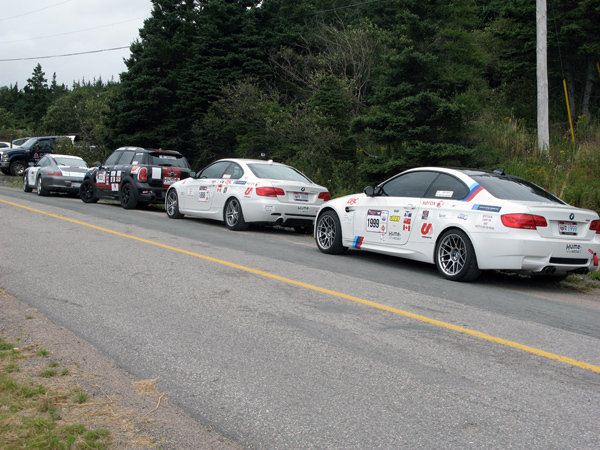 The rest of the day we did better picking up only 2 points in the second last race through beautiful Brigus. Meantime John and Mel ran an almost perfect day picking up only 2 penalty points in race 1. No mean feat considering the penalty window was virtually eliminated. Now Jon and Briar, who’s race it was to lose, did just that – lost it. Yes, their system broke down. Jon missed an early right onto a very narrow bridge through Brigus (turning left in error). Just to complicate matters and prove our theory on adrenaline running out after 4 days, in the second race through Brigus he did exactly the same thing again!!! Final toll: 15 penalty points. Point of reference: the next closest competitor had 1:01 minutes in penalty points. 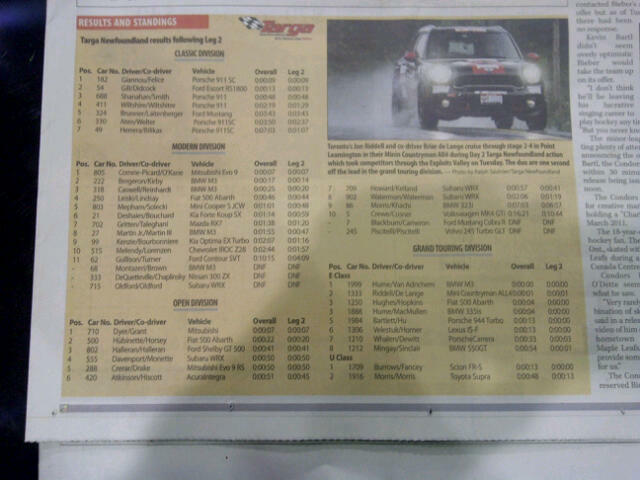 Safe to say, Hume owned the podium at Targa in 2012! But wait, that’s not all. Our team or parts thereof won additional awards. Car #1888 won the “Jerry Churchill Memorial Team Trophy” awarded to any combination of three cars from all categories entered from one country who placed the highest in final rankings (the other two cars were #182 and # 803). Plus Car #1888 & #1999 (both of Hume’s BMWs) won the “Kenzie Cup”awarded to the three highest ranking cars of the same marquee in any race category (the third BMW was car #318, another 3 series from the USA). 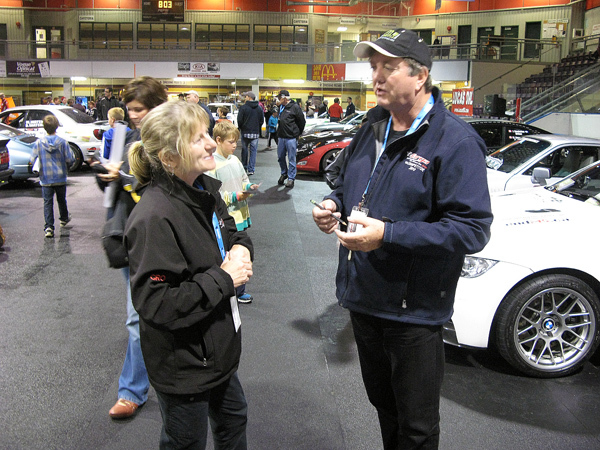 Video update: Michael Engel was producing and uploading the daily video updates for the Targa organization. Jim Kenzie contributed the voice overs and Doug Mepham wrote the daily scripts. Due to Michael’s illness the last installment will not be uploaded for a day or two. But be sure to log onto targanewfoundlandnews.com to view the exciting video reporting of each day’s activities. Finally, we raised almost $22,000 this year and $92,000 over 4 years for MS research. 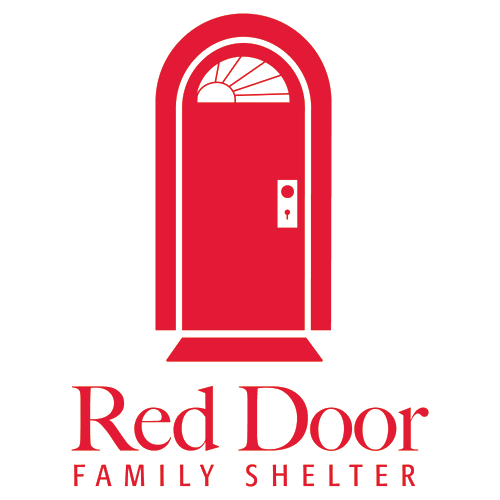 It’s one of the big reasons we participate in this race. A million thanks to all our sponsors! All monies collected go directly to MS research. Hume Intermedia Services Inc. covers all race related costs. Team Hume still leading GT pack! Today we raced 8 fast and technically difficult races. The odometer in car #1888 has malfunctioned, forcing the team to use only the car odometer which is only accurate to one tenth km (100th accuracy is required for the Targa). Despite this drawback, Jon and Briar have managed to stay in first place with only 3 penalty seconds. Meantime, John Sr and Craig are in second place with 8 penalty points and John Jr and Mel picked up 10 penalty seconds along the way today to land them in third place. So Team Hume still leads the GT pack! Weather was great – warm and windy with lots of sun. Tomorrow the difficulty increases, weariness starts to build and the penalty window shrinks. There will definitely be penalties to dish out tomorrow. Stay tuned. Great results on Day 1! So then, we are off to a very good start here indeed. The time clock in race #5 seems to have been a foul. So we have placed an inquiry into the results of that race with race officials. It appears to us that #1888 & #1999 have been unfairly penalized. And other teams have made the same notation on their results. If the race officials decide the clock was malfunctioning then #1999 will jump into a 1st place tie with #1333 and #1888 will jump into a tie for second place with 4 penalty points. However, we may need to wait until Wednesday for the officials decision on that one. There were several car wrecks today and three or four cars are now out of the race all together. Some inexperienced racers seem to have run out of talent. However, no injuries were reported, just car wrecks and bruised egos. Tomorrow promises to be very challenging as hurricane Leslie will sweep through Gander (where we are now) in the early AM. We are expecting high winds up to 100KM/hr and 2 to 3 inches of rain! It will be a very interesting day tomorrow indeed! 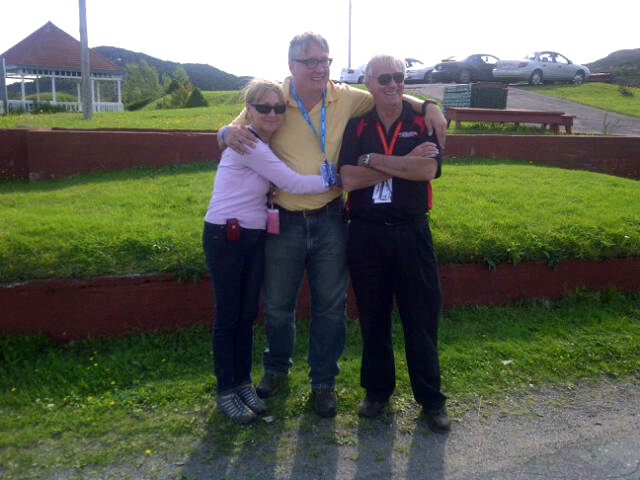 Check out the Targa Newfoundland web site for our Hume produced daily video update for more details, as narrated by Jim Kenzie.